Boy (James Rolleston) and his little brother, Rocky (Te Aho Aho Eketone-Whitu), live with their grandmother and cousins. Their father, Alamein (Taika Waititi), is in jail and their mother passed away after giving birth to Rocky, the latter convinced of having superpowers so strong that he ended up killing her. While their grandma is out of town, Alamein comes for a surprise visit. Boy is over the moon, but Rocky is reluctant. To him, the man before him is a complete stranger and so ordinary compared to how he imagined his father. 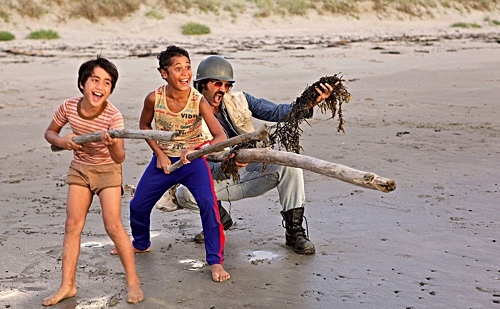 Written and directed by Taika Waititi, “Boy” is largely seen through a lens of innocence, its darker themes just barely sprouting above its desert hopeless landfill. Upon closer inspection, the ratio of children to adults in front of the camera is about one to ten. Though the characters live a simple life in a rural area of New Zealand, there is enough evidence to suggest that the story is also about what neglected children do on top of the brothers having a chance to forge a connection with family member who is not emotionally mature. I enjoyed the natural look of the picture. Simple shots of children playing tag around a ramshackle house, kids walking around barefoot, and someone embracing a goat on the verge of death go a long way. It feels as if the person who helmed the film has a personal relationship with the earth. There is a nice balance of humility and majesty in the images without necessarily drawing attention to themselves. The dynamics among the father and sons hold certain truths especially in the way Rocky looks at his father when they lay eyes on each other for the first time. It reminded me of the past. My father went to America a few weeks after my brother was born. When he returned for vacation several years later, my brother thought our father was just a friend who stayed with mother in the next room. Eketone-Whitu does a good job avoiding hyperbolic sentiments. Instead, he plays Rocky as almost confused, not fully connected to what is really happening or what it means to have a parent figure—who is not grandma—in their lives. Scenes designed to communicate that Alamein is not ready to raise his two boys become repetitive eventually. Since the drugs, alcohol, and even being a part of a gang are expected, the screenplay spends time on them for so long that the material ends up on autopilot. Alamein’s two friends are supposed to be doofuses, but they are neither particularly funny nor are they given anything remotely interesting to say. The film digresses from the brothers’ perspective too often and so its power is only effective in fits and starts. However, “Boy,” I think, makes an excellent companion to Andrey Zvyagintsev’s “The Return“ because both tell a story of two brothers dealing with the reality of their absent father suddenly returning in their lives. The two embrace completely opposite tones. The latter is much more at ease with its darkness, its world mostly drenched in shades of gloomy gray, while the former is more jovial on the outside because the land’s colors and residents’ lifestyles are allowed to pop out.